If you run a Symbian or Windows Mobile device, you have to install Fring. The mobile application lets you do instant messaging (IM) with Yahoo, Skype, MSN Messenger, ICQ, Google Talk and AIM and VOIP (voice over Internet Protocol) calls using Skype Out or SIP. It can also be used with Twitter‘s services. The software works on devices running the Symbian operating system—smartphones like the Nokia N series, E Series, S60 devices and the Sony Ericsson P series—and Windows Mobile devices. FRING ON P1I. 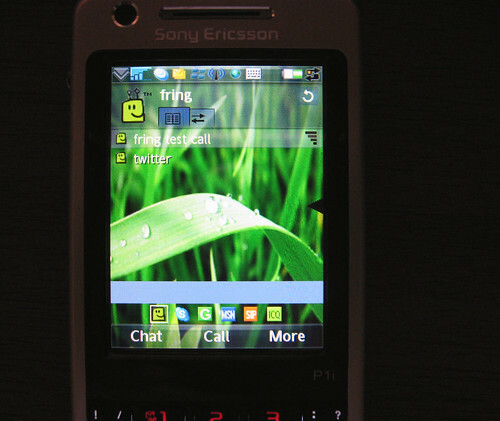 The Fring mobile application running on the sony Ericsson P1i. Click on photo to view larger image. Fring does not only offer IM and VOIP capabilities, it also offers Wi-Fi connectivity management. The application automatically logs you into Wi-Fi hostpots so that you don’t have to deal with setting up your connections. What’s also good about Fring is that it will automatically use free Wi-Fi, when available, instead of your phone’s data plan to save on cost. I got wind of Fring from a comment by Mike Schmeisser in a previous post. I tried Fring on the Sony Ericsson P1i and found the application very easy to use and set up. Less than two minutes after installing it, I was already chatting with a Gtalk contact. To work with Sony Ericsson phones, though, you need install two files. The Fring website will guide you into installing the application.